The Ghanaian midfielder has signed a one-year deal after impressing on trial. 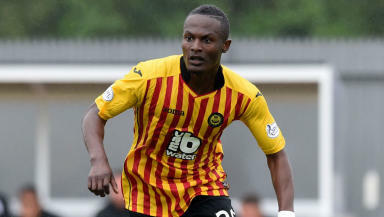 Partick Thistle have completed their second signing of the summer after securing Abdul Osman on a one-year deal. The Ghanaian midfielder impressed while on trial with the Firhill men, playing in the friendly match with Dumbarton at the weekend. Osman is delighted to finally put pen to paper. "It means a lot, its been a long time coming," he said. "I’ve been waiting for it to materialise now for a bit. It’s come along nicely and I’m happy." And Thistle boss, Alan Archibald, has filled him with confidence so far. "He’s given me a lot of hope," he continued. "He wants me to bring some experience to the side, be present at all times and stay away from injury." The top flight division has changed a lot since Osman last played his football in Scotland, but he's looking forward to helping the Jags make an impact this season. "A lot of the big teams are out of here which gives us the opportunity to push up the league," he said. "I won’t know (what’s changed) until about mid-January but hopefully it’s not changed much because the first time I was here it was a good competitive league." Osman was part of Gretna's squad during their one-season spell in Scotland's top flight in 2007/08. The 27-year-old spent three years in England with Northampton Town. Osman then spent a season based in Corfu with Greek side PAE Kerkyra. He returned to England with League One side Crewe Alexandra in 2012.